Born Octover 23, 1962 in Manchester (Catonsville), Maryland, Doug Flutie played college football at Boston College. His “Hail Mary” touchdown pass in a game vs Miami on November 23, 1984 is considered among the greatest moments in College football and American sports history. 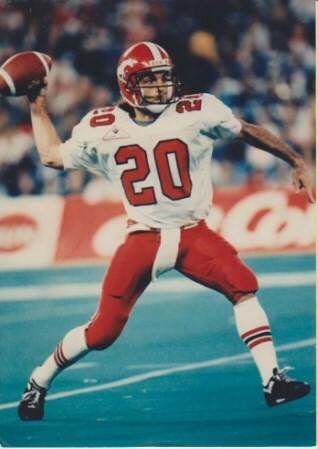 Flutie signed with the BC Lions in 1990 and in 1991, threw for a record 6619 yards on 499 completions. In 1992 he signed with the Calgary Stampeders, who he led to victory in the 1992 Grey Cup. Flutie’s 48 touchdown passes in 1994 remains a CFL record. He played with the Stampeders until 1996, when he signed with the Toronto Argonauts, leading them to back-to-back Grey Cup victories in 1996 and 1997. He left the CFL with career passing yards of 41355 and 270 touchdowns. Doug Flutie was voted the #1 CFL player of all time by TSN in 2006. He is a member of the Canada’s Sports Hall of Fame and the College Football Hall of Fame.